For some reason this picture really bothered me when I first saw it. Why? Well, there are two main reasons for it. First of all, it bothered me because it reminds me of the fact that the New Testament warns that wolves in the pulpit will actually happen. In other words, there is a measure of truth to this caricature, regardless if we like the image or not. This side of the Lord's return, there have been, there are, and there shall always be, wolves in shepherd's clothing. The second reason that it bothers me is that, I am reminded of the fact that these "shepherds" are leading the faithful, who are completely oblivious to their true identity, astray. These poor sheeple are being duped and deceived ultimately by none other than the great deceiver, the devil himself. That bothers me because, though the masses believe and trust the "shepherd" (in good faith), they could still be, not just wrong, but also lost for all eternity. That really bothers me! "I know that after my departure fierce wolves will come in among you, not sparing the flock; and from among your own selves will arise men speaking twisted things, to draw away the disciples after them" (Acts 20: 29-30). Ever hear something from the pulpit that sounded "twisted?" It may have been a wolf in disguise that uttered it. Having said that, I am not suggesting that all twisted-sounding things are from the mouths of wolves. At the risk of stirring up a hornet's nest, it may be that you and I are the ones with the "twisted" theology. One hopes not, but with so many different interpretations historically available to us from the same verse of Scripture, it is logical to assume that someone's interpretation is, well, "twisted." After a long and exhaustive search, the pulpit committee of the Crown of Thorns Baptist Church has found a dynamic new preacher. Owen Tisdale is experienced, savvy, and knows how to pack the pews. There is just one problem: The once-peaceful congregation has begun to unravel. At first, it's just little things ... new members with new opinions, an ambitious public-relations campaign, and old members with nightmares. But as the incidents of mayhem mount, a frightening question must be asked: Just who is this man? Sure, that's just a novel, but it's a novel with a lot of possibility to become reality to one degree or another. From what I have personally witnessed over the years, The Preacher hits a little too close to home. 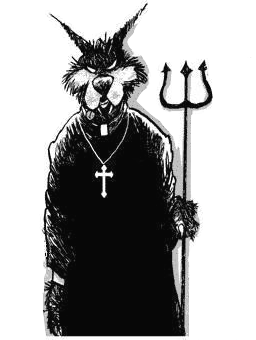 In those situations, was I in the presence of a "Wolf in the Pulpit?" Perhaps I was. As strange as it may sound, I remember hearing a testimony from a church pastor who shared of how he personally came to know the Lord ... after ... having already served several years as a pastor. Now I am not suggesting that he was a wolf in shepherd's clothing before his conversion, but it certainly made me sit up and say ... Hmm. Is the danger real? Absolutely it is! Why would John warn us about being led astray if that were not a real possibility of happening? Unfortunately there will be some who will be so led astray that, though they may think they're in right standing with God, they may still one day hear those unthinkable words: "I tell you the truth, I don't know you" (Matthew 25:12). Is there a way to spot the "Wolf in the Pulpit" and reduce the risk of falling victim to his false and deceptive teaching? What do we do with the "Wolf in in the Pulpit" if/when we encounter him/her there? Quite frankly, I do not pretend to have the answer to these questions. So, if you have some thoughts on the subject, I'd love to hear your take on this. Please do drop me a comment. Peace & Blessings. Maybe we'd be a bit safer if we didn't use a structure that lifts on man over another. If we recognised we are all brothers and sisters with Christ as our head, we might be a little more alert to the dangers. God speaks and moves through all of us, not just a single preacher.